When it comes to “Battlefield Vision”, modern warfighters have a plethora of systems available to enhance their vision capabilities. From systems that operate in the visible wavelengths such as the venerable binoculars, through image intensified systems, still in the visible wavelength, to near infrared systems operating at 900nm to 1700nm, onto thermal imagers systems operating at 3 to 5 micron (MWIR) or at 8 to 14 micron (LWIR), operators vision can be improved over a wide range of distances, low-light and atmospheric conditions. The sheer number of systems available also present a problem. None of these platforms offers comprehensive improvement under all conditions. To do so, right now, the user would have to end up carrying multiple devices. In addition, the user would have to think fast, and decide which is best to use under the conditions in which they are operating. This scenario is much like a professional photographer who carries multiple lenses, but in the end carries more than one camera to remove the need to change lenses. However, a soldier does not have the luxuries of a paparazzi. He or she is already burdened with the weight of his or her kit and equipment, it is not sensible to add to this burden by having to carry multiple viewing devices. Furthermore, the dynamic conditions and split second decision making required on the battlefield, make carrying multiple image devices impractical. Today, system manufacturers are looking to ease this burden by designing and building multi-wavelength systems. These combine sensors that can operate at different wavelengths with as many common components as possible. 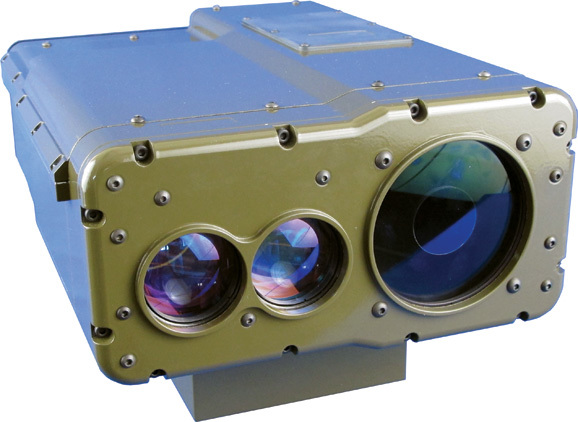 One example of this is the Defence Vision Systems (DVS) laser system which combines visible with near infrared (SWIR) together with a 1550nm laser range finder. In this system the SWIR is used to provide an image of the 1550nm laser spot and the visible provides the high resolution image of the target. The objective is common to both sensors and the output image is fused or merged thus providing the user with an image of the laser spot on the target. This system uses two sensors that are close to each other in wavelength terms, visible at 400 to 800nm and SWIR at 900 to 1700nm. However, the real challenge to developing a true “all in one” system, is to provide a device using sensors with a greater difference in wavelength operation. One such system now under development at DVS combines the two extreme wavelengths of visible and long wave infrared. The system is designed to provide an enhanced night vision system that is easy to fit and use. Thus this combined or fused image system provides a light weight, compact unit for use with existing weapon day sights. The device will also be available with an eyepiece for use as a standalone sight. This new weapon sight is based around an innovative optical system enabling two diverse sensors, visible and long wave infrared, to share a common objective lens. The use of a common objective ensures there is no parallax over the full range of use. The ability to transmit such a wide range of wavelength is based on a unique front element used in conjunction with a reflective mirror optical system and a single narrow curved beam splitter. The splitter provides the relevant wave length to the LWIR sensor and the visible sensor package. Using such a beam splitter ensures that the relevant maximum energy is provided to both sensors. The two sensors are wrapped within the objective lens thus providing a very compact sight system, measuring 10cm x 10cm x 20cm and weighing less than 1kg. Here again and perhaps unusually the sight consists of an objective lens with a sensor at each end, one at the input and the other at the output. To ensure the maximum performance the visible channel is an intensified CCD combination, using the latest multi alkali, high performance photocathode, providing a similar sensitivity curve to that of a Gallium Arsenide photocathode. The thermal channel utilizes a third generation, long wave uncooled bolometer with a 640 x 480 resolution, providing the functions of hot white or hot black and outline. The system is designed to enable the user to select the LWIR image only or an ICCD image only or a merged or fused image. This is via a simple switch operation which is fast and easy to use. The user still has to decide which is best for the conditions but without having to carry other devices or swapping lenses. The fused image is projected onto an associated day sight via a collimator system. The system is currently moving into prototype testing, and is expected to be available December of 2015. System manufacturers such as DVS continue to research more ways to combine such diverse sensors into a single common system to try and achieve the ultimate goal of a system that is all things to all users under all conditions.